that you have followed us here after watching Mr. Jeff Hao's TEDx Talk. We exist because we believe that everyone, regardless of age or occupation, can easily and accessibly experience the joys of playing the piano. Download the Trial Pack. It contains the Hao Staff explanation and some warm-up pieces. Download this Excel file to your computer. It contains titles, composers, MP3 or MP4 file download links. We have stopped maintaining the legacy site and its online shopping cart. Select the pieces you want, write to "service@haostaff.com", and make payment by PayPal to the same email address. The purchased pieces (PDF files) will be sent to you via email. Price per piece is USD7.50, converted from RMB50 as priced on the WeChat App "site" for customers in China, where we are promoting in schools and opening Hao Staff piano players' clubs. "Hao Staff is the most impactful innovation in China in recent years, letting people experience piano playing in the shortest possible time and with the least effort. It will not only benefit the music loving general public, but also the artists, teachers, teaching centers, piano manufacturers, piano shops, concerts and events. Hao Staff opens the flood gate for people wanting to learn for passion (and not passing exams). I hope to live to see the day when the piano loving population in the world overtake the number of car drivers." "Actually, I did try to use Grand Staff to do the same about 3 or 4 years ago. But it was too hard to find the notes, and I quickly gave it all up. I feel that the biggest advantage of the Hao Staff is ... it is simple. One just need to focus a little, and it can be understood in a very short time." "... what is different now is that I don't think music is 'beyond me' any more. I think, perhaps the purpose of Hao Staff is exactly to expel the myths of music brought about by the Grand Staff, making it accessible to all." "The end result was, after about a month, I was able to play the whole piece (Canon in D)! Although I took a month to learn something that only lasts a few minutes, I felt great about it." "Some people say, Grand Staff is easy to learn, too. But I only want to learn a piece once in a while for fun. I don't have the time and effort to train to read the Grand Staff just for that." "My goal is to have fun, and try to enjoy playing the music that I like as best as possible. Initially when I started my lessons I was using the standard music sheets and (my teacher) Eugene introduced me to the Hao Staff. So for a couple weeks I was using standard and Hao Staff in parallel." 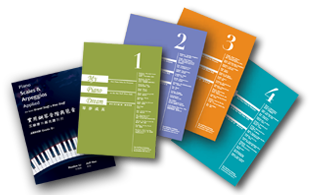 "Quickly I switched to Hao Staff simply because, for someone like me who hasn't learned music, it's just easy to read and you can spend more time practicing than deciphering notes." 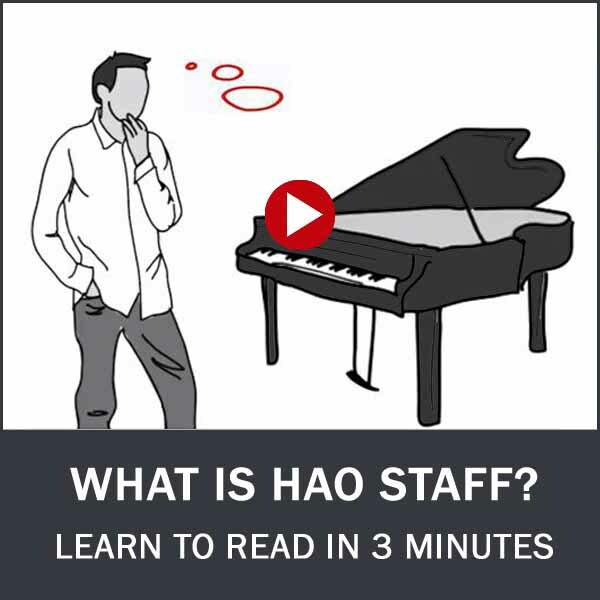 Submit your Youtube video link to be included in this Hao Staff piano players' playlist.